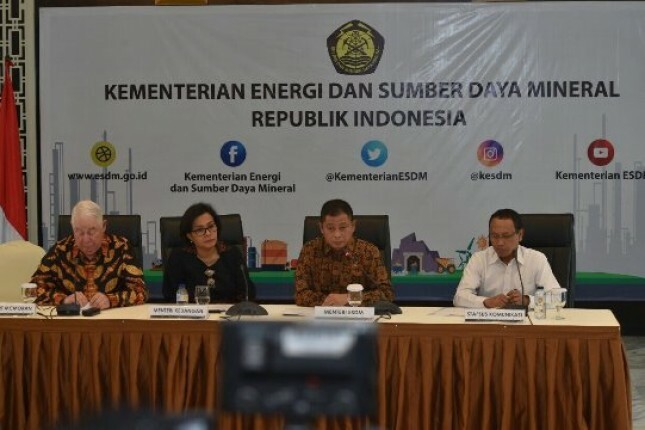 INDUSTRY.co.id - Jakarta- Energy Observer Mamit Setiawan said that the result of the negotiations between the government and PT Freeport Indonesia is a maximum effort. Energy Watch Executive Director, said Freeport's polemic of mining management has begun when the government and the House of Representatives require a smelter or a ban on the export of raw minerals within five years of the issuance of Law No. 4 of 2009 on Mineral and Coal Mining. However, he added, until the maturity of such obligations in January 2014, the government experienced a dilemma. "Freeport's 'Smelter' has not been built up to capacity and if concentrate exports are prohibited, PTFI's operations will be halted and Papua may fluctuate," he said as quoted by Antara. According to him, the decision taken by the government at that time was the concentration of export concentrate with the imposition of five percent export duty and commitment to complete the "smelter" within three years. After three years or right of January 2017, he said, the current government must make a decision, though through long and tough negotiations over 30 meetings. "However, there is an interesting decision from this time, so that the state is more sovereign," he said. Through PP No. 1 of 2017, he continued, the current government requires 51 percent of PTFI shares to become national property, so that the majority of PTFI's ownership is Indonesia. "With almost six months of negotiations, PTFI finally agreed to release the majority of its shares with a further set of processes and procedures," he said. He considered the 51 percent share divestment obligation is an extra government effort, because based on Article 77 paragraph 1c PP Number 77 Year 2014 issued October 14, 2014, PTFI divestment obligations of at least only 30 percent. Mamit added that the 51 percent divestment obligation means that there are still 41.64 percent of Freeport's foreign shares that must be released to the Indonesian side, whether government, state-owned or private. "The government should set up an independent appraisal team to assess the fairness of PTFI's share value and all assets owned by PTFI." Do not let PTFI's value far outweigh its fair value," he said. According to him, based on experience in January 2016, when PTFI once offered divestment of 10.64 percent with a value of 1.7 billion US dollars, the value is clearly high, because the parent company of PTFI is bleeding on the American stock exchange. Current conditions too, he added, is actually still the same. "The government is in a better position because PTFI and PTFI's parent corporations are in a state of decline, so they should not be over-pressing and selling at high prices," he said. Mamit said the most important thing to look at now is who the potential buyers of PTFI shares are. "Do not let it be obtained by rents hunters ahead of the political year 2019. Do not get any scandal 'papa-papa asks for shares' the other," he said. According to him, the 51 percent divestment is a big policy that makes Indonesia will have a Papua mine which has been dominated by Freeport for the most part. Mamit also added another different decision from the government is the export relaxation with exit duty increased from five percent to 7.5 percent through Regulation of the Minister of Finance No. 13 / PMK.010.2017. In addition, he continued, Freeport must also complete the construction of a "smelter" in five years whose progress is evaluated every six months by independent verifiers. In fact, PTFI would like to change the form of operating exploitation from the contract of work to a special mining business permit (IUPK), so that the state has a higher position against the permit holder. "After PTFI's first-generation contract of work was signed in 1967, it is time for Indonesia to be more sovereign in its own country," Mamit said.